If I’m being honest, I never really liked Neelix. He annoyed me to no end, especially in the early seasons of Voyager when he was with Kes. Their relationship was a level of weird that I could never wrap my head around. If it was a Neelix-centric episode, I usually changed the channel and waited for next week. Until I saw “Mortal Coil,” that is. “Mortal Coil” aired on December 17, 1997, but I didn’t get a chance to see it until it was in re-runs. It helped catapult Neelix to one of my favorite Voyager characters, and I never get tired of seeing it because I can relate to a TV show better than I can most other things. Neelix dies. And thanks to Seven of Nine and her plot-device nanoprobes, he comes back to life. Understandably, he has some issues. This is the episode where we learn how much family and faith mean to him. Neelix’s stories and belief structure does a lot to comfort him. Over the course of the episode, we see him deal with the fact that his beliefs have fundamentally changed. In the first season episode “Jetrel,” we learn that his entire family was slaughtered in a mass genocide. The only way he will see them again is when he arrives at the Great Forest, where they will come to greet him and help him move on to the afterlife. This is a great comfort to Neelix. It’s how he copes with his sudden and tragic loss, and how he deals with his past. Instead, when he dies in “Mortal Coil,” all that he finds is darkness. Nothingness. He feels like his faith betrayed him, that everything he was told and put such stock in was nothing more than a fairy tale to help people feel better. I’m sure we all can relate. We also see a fair example of four of the five stages of grief through this episode. After being brought back to life, Neelix has some very subtle denial. He insists that he feels fine, that everything is right in his world, and wants to get back to work right away. The ever-amazing Captain Janeway has to insist that he takes some time off and come to terms with what just happened. Depression can be spotted when he is in the holodeck with Chakotay, staring at his dead representation on the floor and it comes in an outburst. It almost seemed like Neelix was waiting for the holodeck to show his soul leaving, preparing to go to the Great Forest. His anger shines brightly when it is directed at Seven of Nine in the mess hall, where he exclaims that he didn’t ask to be revived. 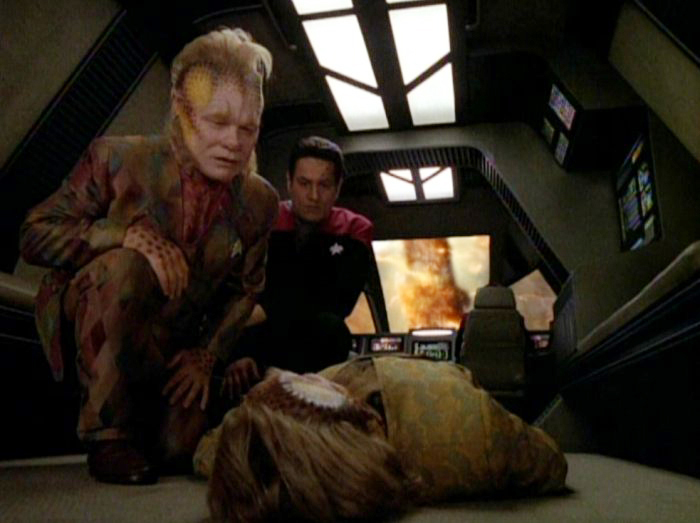 In the end, Neelix finds acceptance by attempting to take his own life. It seems that he feels like this is the only way he can move on from what happened. Neelix is wrong. As I have come to learn, harming yourself isn’t going to fix any of your problems, it just causes a whole slew of new ones. Luckily for him (and my by-the-minute growing appreciation for his character), Chakotay and little Naomi manage to get through to him. He is needed, he is loved, and monsters won’t hunt themselves. By the end of it all, Neelix found a new family and a renewed purpose on Voyager. This episode did a lot for me. I first saw it at a time when my entire world was changing – my mother was battling illness, I was questioning the faith that I was raised to believe was the gospel truth, and I was dealing with own issues with harming myself. Even though I knew that he wasn’t real, it felt like someone understood at a time when none of my friends had any idea what my day-to-day life was like. 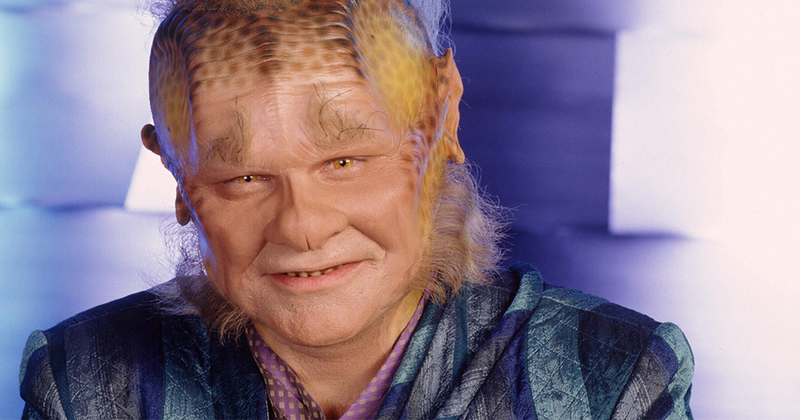 It also gave me a better appreciation for Neelix. He really is the personification of the sad clown, holographic lungs notwithstanding. With help from The Five Stages of Grief and of course Memory Alpha for jogging my memory. Grief comes in all forms and for different reasons. A death is a death if it is a person, a divorce, or even changing from a girl to an adult. I have been in grief several times in my life and I agree that you can project this grief and feeling of loneliness by watching on TV what you are experiencing. I have seen a little girl have to experience loss and rise like a phoenix to become a young women. Thank God for Neelix. Excellent article, and so on point with this statement. I believe many of us had similar journeys with liking Neelix as a character. I also found him quite annoying originally, both in his belligerence toward Tuvox to be more jovial, and his frightening attempted manipulation of Kes. Both this episode and Jetrel helped me see him as a whole person. Some people are great at some things and terrible at others. Neelix is great in the kitchen, great at being resourceful and creative in tough situations, great at being welcoming with new people, patient with kids, and deeply loves his family. We see him be terrible with personal boundaries (Tuvok) and terrible with respecting his partner in romantic relationships (Kes), but these are areas a person can grow and evolve, and I like to believe that, as complex being, he does. Also, many of us are able to put on a happy face while dealing with something difficult, either long- or short-term. Neelix is a perfect example. While I did come to know him as a character able to access a real happiness within, when things become tough for him he isn’t able to drop the external cheerfulness, and thus ends up hiding behind it. Familiar. Oh so familiar. Thanks again for exploring a great topic so well!